Insects are always a part of interacting with vegetable, fruit, and ornamental plants in your home or garden. Although many people see insects around their homes or gardens on a frequent basis, many are left asking questions. Mostly, everyone wants to know whether or not their mystery insect is a pest, but some want information about where they come from, how they live, and what they do to survive. For all of these reasons, this summer West Madison ARS will be featuring life cycle and pest status information on selected insects each week that we’re seeing around the gardens on our own fruits and vegetables in an effort to help everyone learn more about the insects around them. Remember, not all insects are pests! Most are, in fact, not pests at all – and a great many contribute enormous benefit to humans. Up this week: the Spotted Asparagus Beetle and the Common Black Ground Beetle! We’ve seen a lot of both of these guys around the station in the past few days. We’ll talk about the Spotted Asparagus Beetle first (pictured below). 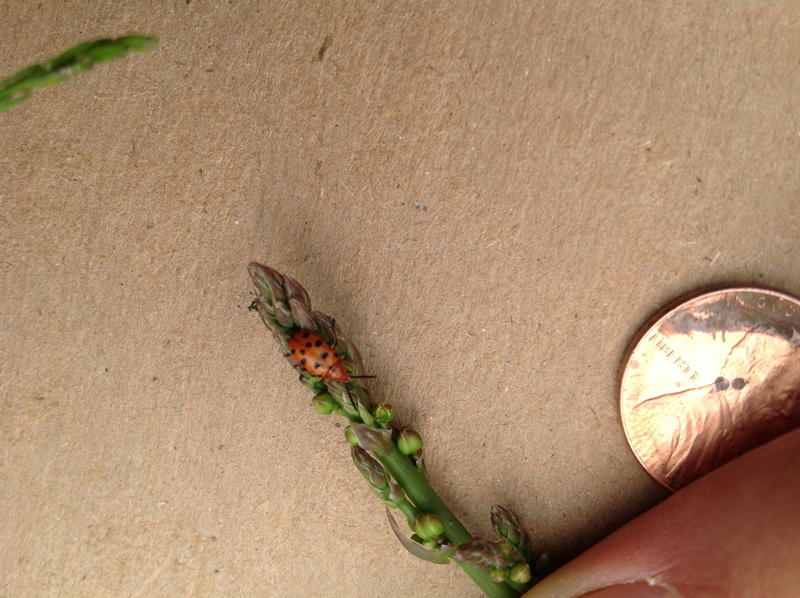 The Spotted Asparagus Beetle, pictured above, is a common insect found in many vegetable gardens across North America. This insect is considered to be a pest of asparagus, and was accidentally introduced to North America from Europe in the late 1800s. This insect can often be observed in the foliage of the mature asparagus plant during the spring and summer months in many gardens. The larvae of the spotted asparagus beetle bore inside of asparagus plants and consume the pulpy tissue inside, while the adults attack the foliage of mature asparagus plants. This insect is able to overwinter as an adult in your garden, sheltering in stems of fallen plants or other garden debris. 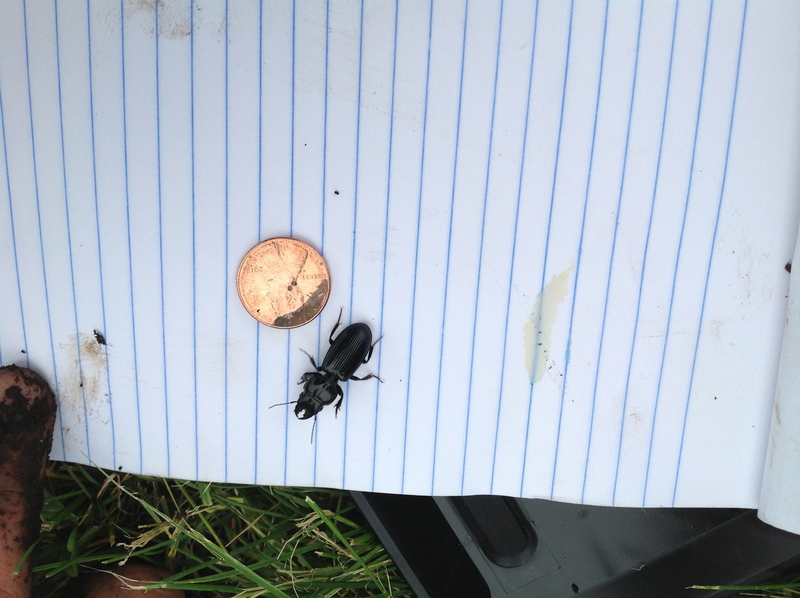 Our second insect of the week is the Common Black Ground Beetle, pictured below. The Common Black Ground Beetle, pictured above, is an insect that is often found by gardeners who are turning over their soil for the first time in the season or moving straw or other garden residue. The Common Black Ground Beetle is a member of the insect family Carabidae, also known as the ground beetles. Like other members of its family, the Common Black Ground beetle is a mobile predator, feeding on caterpillars and other soft insects using chewing mouthparts. In spite of its fierce appearance, this insect is NOT a pest! They consume many insects that would otherwise harm your garden, serving as a method of natural pest control, and should be a welcome addition to any garden or landscape. Thanks for reading, and check out the new Insects of the Week post every Monday, all summer long! This entry was posted in Uncategorized and tagged Dane County, gardens, Insect of the Week, insects, madison, plants, University Display Gardens, wisconsin, WMARS by bemerson. Bookmark the permalink.